Once upon a time there was a little frog that lived near a palace. The frog used to hear stories of frogs turning into a handsome prince by the blissful kiss of the princess. As a child he loved the story so much he would ask her mother to say the story again and again. May be his mother had told this story hundreds of times still the next night when he would have been trying to sleep. He would again ask her mother to tell the same story again. Even he dreamt of the same blissful truth of being turned into a handsome prince and riding the horse with his beloved princess. And saying “beloved Princess Look at that beautiful pond we had a small home near that pond” and he would get so excited and wake in the middle of the dream smiling. He suddenly looked at the mirror and would saw the same face called to be frog and he used to get a little depressed and would sleep again to fall in his vivid imaginations. 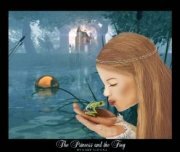 One day the frog was day dreaming about the magical princess and he in fact saw a beautiful princess who was throwing pebbles in the pond listening to its sound and watching the ripple vanish. Then she would throw another stone and feel that pond. The frog was simply spellbound looking at the princess and he was so struck from her eternal beauty. He had not seen such an angelic person in his whole life. And at that moment the frog was struck with the idea this is the princess whom I have been dreaming. And she is the one who would in fact turn me to a handsome prince. He simply couldn’t resist and just went to hear and started talking with the princess. He was so enthusiastic that his talks were mesmerizing. The princess listened to her for hours and hours till the sun was red and sets in the west. He told about his dreams and desires and one day he even told that she was the princess to whom he had been dreaming. He was so obsessed with his dream he even said that the princess that I saw in dreams had the same face as yours. He also said that his magical kiss at the occasion of our marriage I too would be turned into a handsome prince by your divine kiss. And he told about his dreams of giving her eternal peace love and happiness when he would be turned into a prince. The words of the frog were too blissful and his eyes were very true filled with endless desires and true love. And since the love and dreams of the frog was so intense she felt that in fact that he may be very true. And she too had heard of stories of frogs turning into prince when she was a child. Then the frog gave her a beautiful flower and said will you marry me. The princess was filled with tears from his pristine love. And she said “ Yes I would” the frog was so happy he jumped and shouted yes” He felt so happy that day and he couldn’t even express to his mother how joyful it was to be in that situation he was just beyond imaginations. Though he was not rich hence he had to sell all his and his mother’s belongings to have a beautiful dress which he would wear after turning into a handsome prince. Then the princess told the entire story to her father and hearing all the stories and thinking nothing could be done at that point. He said “ok if you think that’s the truth you can marry that….” He took a long pause and finally said “Frog”. She was so happy to have got such an understanding father she was too in a very good mood and she came running to tell her love about the good news about the approval of their marriage. The king made an announcement of that day that her beloved princess would marry a frog. And everyone was so confused and they were talking with each other that what had happened to our king had he gone mad or so. The magical transformation of frog to a handsome prince was simply too foolish and yet the King believed on that matter. Hence that topic was a matter of talk in everyone’s mouth. The news was so intense that even the smallest child in the country had known about the story. The day had finally arrived and the most grand and biggest palace hall was so packed with visitors all over the country. And in fact thousands of people had come to see the transformed prince from all over the country. And they were eagerly waiting outside of the palace hall even to see the transformed prince after the magical kiss. The frog and the father were there in the middle of the hall waiting for the ceremony. Then finally the blissful princess arrived swaying her long dress which trailed lot longer. He was so stunned at that moment looking at his beautiful beloved. Though there were hundreds of people he couldn’t hear or see anyone over there because he was in deep love with the princess. Then both of them were in the middle of the hall. Then the people shouted that it won’t be fair to marry first. They said “that they want to see him turn into a prince and only he could marry the beloved princess.” The idea soon took a big dimension and even the king needed to say ok because he was a loving king too. Then they too agreed to have the kiss and every one’s eyes were opened so wide that in fact no one were even blinking. Then the princess holds her beloved frog in her hands. The frog closed his eyes to feel the blissful kiss and suddenly found that he had just been kissed. An utter silence arose in the room everyone were so blank and even the breathing could be heard. The frog was thinking that he had turned into a handsome prince and everyone was just spellbound to see him turn into a handsome prince. But only when some one came with a mirror and showed that he was still the same frog that he used to be then he was like struck by a lightning. And at that moment he remembered about his past dreams when he would have god the dream of a princess kissing her and he would have suddenly woke in the middle of the night to see the same frog in mirror. He was deeply shattered and very upset. He looked at the dress that he had made for and shifted his eyes which were filled with tears towards the princess. He cursed within himself for breaking the heart of princess. He was so ashamed he was thinking to die. The princess was too shocked that the story didn’t come to be true. She too was much struck; but she soon came to realize that she was being so foolish. Frogs don’t turn into handsome princes. And if the little beloved frog loved her so much then in fact that little frog was her prince. Then she started breaking the silence that she would indeed marry the same frog even thought it didn’t turn into a magical prince because she loved him very much. All the people started talking with each other and there was a chaos of people saying this and that. And finally the king spoke and again everyone listened to what their king was saying. He said that “If my daughter the princess loves a frog and she wants to get married with even the frog I don’t have any problems she can do as she has desired of…” Then again gossips and talks were there and some one asked the priest to forward the process. Then the priest read the holy lines and they got married in aspects of religion. Then the priest said the bride can kiss the groom. Then the frog hadn’t lost his imaginations about being a handsome prince in fact he was thinking that this time the miracle would happen and everyone would be so spell bound. Then finally the princess again held him in her hands and gave a loving kiss with a pure and true heart. This time too both of them closed their eyes and when she opened her eyes the frog was the same little frog but she hadn’t dreamt of prince that time. But when the frog came to see that the princess too had turned into a little frog. He felt very warm and delighted looking her as himself. He even couldn’t control his emotions and just jumped here and there. Other persons in the hall were so shocked to see their princess turned into a frog. Even the king was shocked and came running to pick her daughter. She said “No worries father I am absolutely very happy to be a frog and now I feel more closely to my beloved love I thank you for being so kind and generous”. Hearing his daughter’s words he was so filled with emotions but he soon realized that she was very true indeed. And after that day he didn’t had dreams to turning into a handsome prince. And hence they lived a very Happy and Peaceful life near that beautiful pond and his mother was also very happy to find her son with her for ever…..